(Nanowerk News) A new study has found that “waviness” in forests of vertically-aligned carbon nanotubes dramatically reduces their stiffness, answering a long-standing question surrounding the tiny structures. Instead of being a detriment, the waviness may make the nanotube arrays more compliant and therefore useful as thermal interface material for conducting heat away from future high-powered integrated circuits. Measurements of nanotube stiffness, which is influenced by a property known as modulus, had suggested that forests of vertically-aligned nanotubes should have a much higher stiffness than what scientists were actually measuring. The reduced effective modulus had been blamed on uneven growth density, and on buckling of the nanotubes under compression. However, based on experiments, scanning electron microscope (SEM) imaging and mathematical modeling, the new study found that kinked sections of nanotubes may be the primary mechanism reducing the modulus. The research, which was supported by the Defense Advanced Research Projects Agency (DARPA), was published online August 31, 2013, in the journal Carbon ("Waviness reduces effective modulus of carbon nanotube forests by several orders of magnitude"). Carbon nanotubes provide many attractive properties, including high electrical and thermal conductivity, and high strength. Individual carbon nanotubes have a modulus ranging from 100 gigapascals to 1.5 terapascals. Arrays of vertically-aligned carbon nanotubes with a low density would be expected to a have an effective modulus of at least five to 150 gigapascals, Sitaraman said, but scientists have typically measured values that are four orders or magnitude less – between one and 10 megapascals. To understand what might be causing this variation, Sitaraman and Ph.D. students Nicholas Ginga and Wei Chen studied forests of carbon nanotubes grown atop a silicon substrate, then covered the tips of the structures with another layer of silicon. They then used sensitive test apparatus – a nanoindenter – to compress samples of the nanotubes and measure their stiffness. Alternately, they also placed samples of the silicon-nanotube sandwiches under tensile stress – pulling them apart instead of compressing them. What they found was that the effective modulus remained low – as much as 10,000 times less than expected – regardless of whether the nanotube sandwiches were compressed or pulled apart. That suggests growth issues, or buckling, could not fully account for the differences observed. 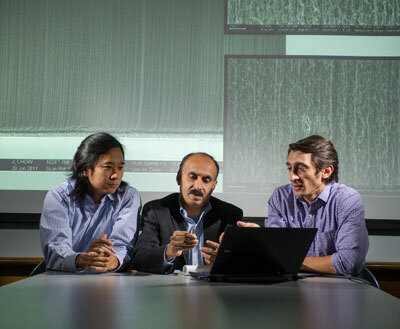 To look for potential explanations, the researchers examined the carbon nanotubes using scanning electron microscopes located in Georgia Tech’s Institute for Electronics and Nanotechnology facilities. At magnification of 10,000 times, they saw the waviness in sections of the nanotubes. They also noted that under compression, the nanotubes contact one another, influencing nanotube behavior. These observations were modeled mathematically to help explain what was being seen across the different conditions studied. Though the loss of modulus might seem like a problem, it actually may be helpful in thermal management applications, Sitaraman said. The compliance of the nanotubes allows them to connect to a silicon integrated circuit on one side, and be bonded to a copper heat spreader on the other side. The flexibility of the nanotubes allows them to move as the top and bottom structures expand and contract at different rates due to temperature changes. Carbon nanotubes have extraordinarily high thermal conductivity, as much as ten times that of copper, making them ideal for drawing heat away from the chips.